Your thyroid plays a part in nearly every metabolic process and when the thyroid isn’t working you won’t feel well! This small gland has an average weight of 16.4 grams in the adult. Shaped like a butterfly, it lies low on the front of the neck and below your Adam’s apple and in front of the windpipe. When the thyroid is its normal size, you can’t even feel it. The thyroid secretes several hormones, collectively called thyroid hormones. The main hormone is thyroxine, also called T4, but there are others, including T3 and even lesser known T1 and T2. It requires adequate selenium, iodine, zinc, B vitamins and antioxidants for optimal function. Thyroid hormones act throughout the body, influencing metabolism, growth and development, and body temperature. During infancy and childhood, adequate thyroid hormone is crucial for brain development. Unfortunately, the thyroid gland is uniquely sensitive to drugs and environmental chemicals which may affect proper function. More than 10 percent of the general population in the United States, and 20 percent of women over the age of 60, have subclinical hypothyroidism. But only a small percentage of these people are being treated. It is important to ask your doctor to check you thyroid function if you feel that you are having symptoms. Often, at first, you barely notice the symptoms of hypothyroidism, such as fatigue and weight gain. You might simply attribute them to getting older. But as your metabolism continues to slow, you may develop more obvious signs and symptoms. Always consult with your healthcare practitioner before using supplements included at Hypothyroid Mom. Eliminate gluten from your diet! One in three patient’s with Hashimoto’s thyroiditis are sensitive to gluten. Selenium is essential to a healthy thyroid and the first thing I recommend for those with autoimmune thyroiditis or Hashimoto’s. Get 200mcg of selenium in this supplement by Pure Encapsulations. Wild caught fish, like salmon, supply ample omega-3 fatty acids which are essential for optimal thyroid function. If you don’t eat fish frequently, you can supplement with a high quality Omega3 supplement, like Thorne Research Omega Plus 2-3 caps daily. Get plenty of sunlight to optimize your vitamin D levels and take 1000-2000IU daily of Vitamin D3, like Thorne Research D-1,000 . Herbs that support thyroid function include ashwaganda, eleuthero and other adrenal adaptogens. One of my favorite formulas is Gaia Herbs Thyroid Support . Dandelion greens, carrots, spinach, kale, Swiss chard, collard greens, and sweet potatoes are all rich sources of essential Vitamin A. I feel that goitrogens in moderation or sauteed, cooked or steamed are not a problem. The only caution is those who are using raw greens in large quantities for smoothies or juices, which can be a problem. There are so many benefits to these foods that, even in the case of hypothyroid, I would not recommend avoiding them entirely. Use organic coconut oil in your cooking — it’s great for high heat cooking and sautéing many different meats and vegetables. Filter your drinking water from chlorine and other harmful chemicals which suppress the thyroid and block iodine. I recommend the Berkey Water Filtration System for the VERY cleanest water money can buy! It’s portable, too! Find daily ways to detox, like using an infrared sauna. Check that the sauna has been tested to ensure it emits low levels of EMF (electromagnetic fields) such as the saunas by Sunlighten. Other ways to help your body detoxify from chemical exposures (petrochemicals, PCBs, pesticides, and mercury) include taking epsom salt baths and adding chlorella, parsley, or cilantro to your daily smoothie. Work on lowering stress levels through daily gratitude, prayer, meditation, yoga, deep breathing! Potassium perchlorate, which inhibits iodine uptake by the thyroid, is used in rocket propellant, fireworks, and automobile airbags. Potassium perchlorate is stable in the environment and contaminates water throughout the United States. Newborns and infants are most susceptible to this inhibitory effect on iodine transport. The thiocyanates in cigarette smoke can have effects similar to potassium perchlorate. Isoflavones (phytoestrogens), found in soy proteins, are thyroid peroxidase inhibitors. Pesticides induce glucuronidation of T4 and reduce T4 half-life. Polychlorinated biphenyls are industrial chemicals that were banned in 1975 but still are routinely detected in the environment. They have been shown to reduce T4 levels in animals and are neurotoxic. Their effect varies because of partial agonist effect at the thyroid hormone receptor and their varied chemical structure. Bisphenol A—used in plastics, as resins for coating food cans, and as dental sealants—antagonizes T3 activation of the thyroid hormone b-receptor in rats, causing a thyroid hormone resistance–like syndrome. Keep your home free from these and other toxic chemicals. If you are truly hypothyroid, no amount of nutritional supplementation will replace your abnormally low levels of thyroid hormone. Ask your doctor to do comprehensive thyroid lab testing including: TSH, free T4, free T3, total T4, total T3, reverse T3, thyroid peroxidase antibodies (TPOs), and thyroglobulin antibodies (TgAb). An ultrasound to evaluate the appearance of the thyroid is necessary if you are experiencing symptoms of enlarged thyroid or nodules. Dr. Jill Carnahan uses functional medicine to help you find answers to the cause of your illness and the nutritional and biochemical imbalances that may be making you feel ill. Functional medicine is personalized medicine that deals with root cause of disease instead of just treating symptoms. Dr. Jill will search for underlying triggers that are contributing to your illness through cutting edge lab testing and tailor the intervention to your specific needs as an individual. Dr. Carnahan’s office Flatiron Functional Medicine is located in Boulder, Colorado. How could this 3 year old article have so many recent comments? Hi John, This is Dana Trentini from Hypothyroid Mom. While this article was written 3 years ago it’s so great that it ranks high on Google when people search for hypothyroidism symptoms so that would explain ongoing comments here. Plus it’s still relevant even if it is 3 years old. My wife hypothyroidism for few years now.she is always tired .she sleeps 9-10 hours a day.she works full time.she takes levrothorince.she also takes vitamin d vitamicc vitamin b 12 and selenium. She has little or no libido.I don’t know what else to do. I wasn’t my old wife back. Philip – get her off that drug. Get her on WP Thyroid when it becomes available again. In the meantime, get her on either NP Thyroid or Nature-Throid. World of difference. Big dietary changes may be needed: wheat, all unsaturated oils – bad. Has anyone ever taken nature throid or armour without seeing a doctor, and ordering it online somehow? I live in a rural area, am on Medicaid, which limits my scope of doctors. The ones I have seen wont even listen to my symptoms and will only trust TSH levels, which I am waiting on. And they dismiss me as soon as they hear “thyroid”. Thyroid issues run in all women in my family, and I suspect it has been the source of my problems for around 10 years.I cant pay to see a naturopatb or progressive doctor now, but I am so desperate to get on t3/t4 meds. I have been taking Armour Thyroid for years but it is by prescription. Taking it completely changed my life. I would recommend it to anyone. You don’t get T3 from Synthroid and a lot of people need and increase in T3. Good Luck! You might try this product https://www.healthysupplements.net/Eco-Thyro-by-Professional-health-Products-p/194.htm. My functional medicine doctor put my son on it. He says it is a really low dose thyroid. It helped my son tremendously. Hi everyone. I got tested and mine is .08. Feel nasty many signs from the list. I hate not being able to sleep and being tried all the times. Out of money so going back to the doctor is not possible right now. I am trying to find the correct amt to feel alive again. Hello, I’m so glad I found this group. I just found out that my thyroid functions are low, which is also considered hypothyroidism. I’m kind of relieved to know the reason of my misery- haven’t been able to have a good night sleep for months, no energy what so ever, skin rash, heavy breathing and etc. My results say <0.01 mIU/L. Anyone know what kind of treatment I should expect for these type of results? Hi! Thank you for this informative article! I’m a 30 year old women who has been struggling for 2 years with dry brittle hair/ hair loss, heavy periods, weak immune system and more recently depression. I was diagnosed on Wed by an endocrinologist with hypothyroidism. My doctor put me on a low dosage of synthroid and I am already feeling more energized and less depressed. I’m wondering how long it will take before my hair grows back and gets strong again? Although all of my symptoms are stressful I have to admit losing my hair has been the hardest part. Thanks in advance for any feedback !!! Also will the supplements listed in the article help with my hair? My dermatologist has me on the hair health supplements Biotin and Zinc for a year but I haven’t seen any improvement. I was put on Synthroid after a TSH that was slightly elevated. I have more symptoms of hyPER thyroid than hypo, AND at the time of the test, my hormones were super wonky (I had been through early menopause 3 years earlier, went to see doc when I suddenly had a 30-day menstrual period with terrible cramps- it went away as suddenly as it showed up) I have noticed fatigue but my resting heart rate has been 100bpm on good day, and I am terrified that this medicine which seems to have more side effects than things that are good for me will not help my heart, and there is so much heart disease in my family history. I gained weight suddenly that I can not lose, have noticed more hair loss, but this all seems a bit much. Like “killing an ant with an atom bomb”. I wish there were a magic pill that would take this weight off and give me back my thick hair, but I am just so concerned about my heart and any anxiety. Is it true that once you start synthroid, you always have to take it? I wish I could sit and talk with my doc but am afraid he will yell at me for not taking meds. 🙁 I wake up anxious about this every day. I just don’t check many boxes for hypothyroid and I already have chronic migraine and Fibromyalgia. I don’t have space for more. 🙁 Help? Fact #1: No doctor will get mad at you for noticing symptoms and trying to educate yourself. Fact#2: No you do NOT have to take synthroid forever, unless your thyroid has been completely removed or irreversibly destroyed. In fact, thyroid function can fluctuate like any other organ in the body, and when prescribing thyroid hormones, doctors usually adjust the dose according to your need by checking your symptoms and your lab tests. People need various amounts of the medication to function normally, and even one single body may need a different amount than what it needed before. Fact #4: please GO SEE YOUR DOCTOR ASAP. Doctors are trained to help, and will not judge you. I would tell everyone to keep searching for a doctor that will actually listen to you & how you feel, along with your blood tests. My thyroid doesn’t work at all, it was “nuked” when I was 18, also made me sterile & enter menopause in my twenty’s. Seeing another new doc tomorrow, do we will see what happens. Connie, I am so sorry you have been through so much, that is awful. It is a terrible thing to not be able to have kids, I know that. Have you found a good doctor? Finding one who has time or will make time to really listen seems to be key. Hard to know where to start though. I wish you the absolute best! Go to Stop The Thyroid Madness.com website. You will learn a lot. TSH doesn’t really tell you much. You need a full thyroid panel. My TSH was checked at 0.98…is that low? I have so many symptoms including extreme fatigue, my memory is becoming non-existent, and my hair is thinking all over my body. The Dr said it was within normal range. Thinning. I meant to say thinning, not thinking. 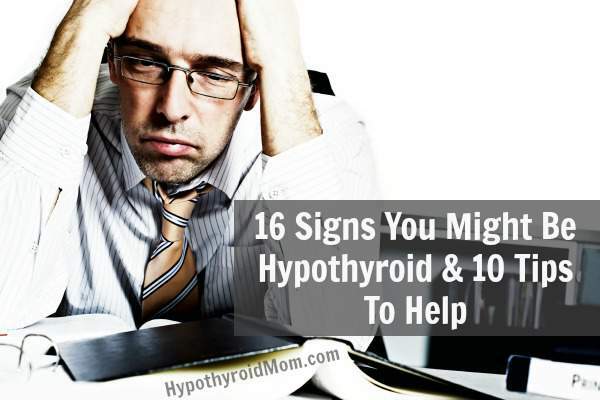 I have rather a large number of signs of hypothyroidism. I have no functioning thyroid at all. My physician has recently reduced my dosage of thyroxin and I have had nothing but trouble since then. I do not know whether she is testing for all of you feel necessary. My physician only tells me my thyroid level is too high–12, whatever that means. as she is a graduate of Harvard school of medicine and is head if the internal medicine department she does not like to be questioned. I wish I could print this to show her on this Monday appointment. I have been told mind was “fine” for years at .450, I finally went to a doctor who listened and I’m feeling better in just days!! Normal is from .300 to 5.0. I would think that 12 Really IS too high. I just got tested. Mine in 71.9. Yes I typed that correctly. and its supposed to be below 0.9 !!!!! I’ve been tested every year and no one had ever said anything until I pushed. This makes me so mad! I don’t care here this snob wet to school, you pay her for a service, right? That means she works for YOU! And it is in the path she took to be a doctor, so you demand attention and care!! If you are scared like I tend to be, take a brave friend or family member with you!